Welcome to Llewellan! 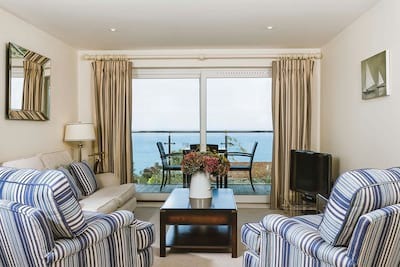 This beautiful first floor apartment has been stylishly created to offer a calm coastal ambiance where up to 4 guests can relax and discover the quieter shores of Carbis Bay. As perfect for a friends weekend as family holiday the considered layout ensures ample space for all with large open plan living space, 2 welcoming bedrooms and contemporary bathroom. 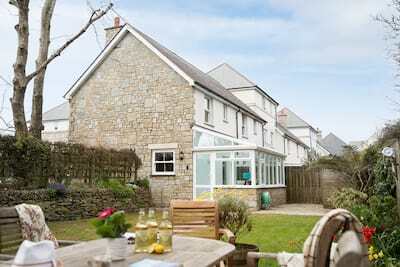 Llewellan offers private off road parking and is just a short walk to Carbis Bay beach or to the St Ives branch line train. 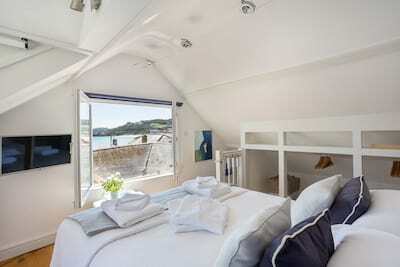 Soak up the panoramic sea views and enjoy this well placed holiday home-from-home. 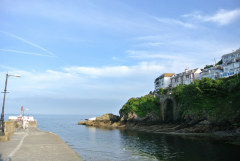 The apartment is located within a period property in the quieter area of Carbis Bay. Upon arrival, an internal flight of stairs leads to the landing and the light and airy first floor level. 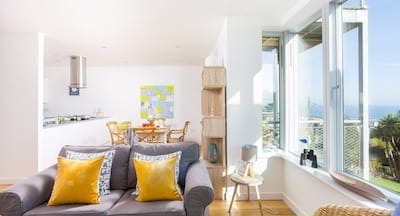 The living room is set under the large bay window which perfectly frames the ever changing coastal views and characterful beach life below. Relax after a day exploring or hunker down for a winter afternoon out of season. The kitchen is well equipped with all you need from late breakfasts to holiday suppers and the round dining table brings the party together to dine. The master bedroom has been beautifully decorated in cool coastal blues and whites with the finest bed linen for a luxury nights sleep. The twin bedroom offers a nautical twist with smart navy and white print. The enviable contemporary bathroom is perfect for a post beach pamper with large power shower and deep bath. From your holiday front door, enjoy an al fresco dining experience with wonderful sea views, a large wooden round table with 4 chairs is for your private use. From the terrace, steps lead down to a charming coastal garden which brims with colour from Spring to Autumn. This beautiful garden is shared with the ground floor holiday apartment and offers ample space for children to play safely. Small pockets of garden offer thoughtfully placed benches and further dining furniture all offering panoramic sea views for the perfect backdrop. From the bottom of the garden a wooden gate leads onto the coastal path and runs along towards the station and the beach. 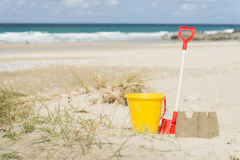 Enjoy the luxury of the location and travel from Llewellan to the seashore in approx 5-10 minutes. The branch line train hugs the coastline along to St Ives centre where a host of wonderful places to eat, cool artisan shops and cafes await. 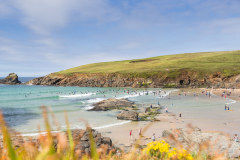 Pack up for a day trip out and head to the quintessential Cornish coves of South Cornwall or the rolling surf and dramatic clifftop scenes of the North. 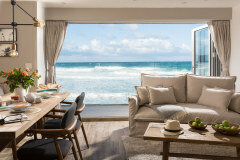 Whether a short break or weekly stay, this beautiful coastal apartment sets the scene for a relaxing stay Cornish style! The kitchen, lounge and dining room windows do not have curtains and blinds. Excellent apartment. Spotlessly clean and very comfortable. Very tasteful decor. Very well equipped kitchen with more than everything needed. Lovely, well tended garden. 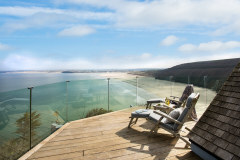 AMAZING views over Carbis Bay. Would definitely return one day. Really thoughtful provisions. They were a really welcome treat. Fantastic. Couldn't ask for more Beautiful place which was clean and inviting. It was every bit as good as the website pictures which were stunning. A million dollar view from the window! It was a beautiful apartment in a perfect location! Excellent location and views. Clean, well equipped. 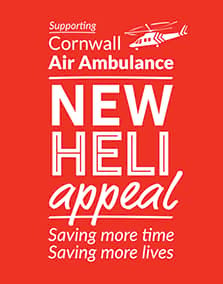 Professional service from Cornish gems as usual. This property was first class far better than our expectations. Great view from the window to the sea. We had a wonderful stay over Christmas. The property was brilliant, very comfortable and clean. The view from the lounge/kitchen window was fabulous. Would definitely visit again. Could not fault the property. We enjoyed our stay thank you. Very nice property overall. Love the garden. Sharing it worked fine. Beautiful properties in perfect locations. The property was lovely and the views absolutely stunning and perfect location. Beautiful property with fantastic views, need I say any more. We have stayed in 2 different properties with Cornish Gems and both have been beautifully decorated and were spotlessly clean. They were warm and well-equipped too. 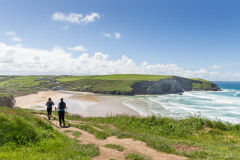 They have also both had fabulous views! We can't wait to come back! 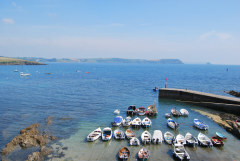 A lovely apartment in an excellent location with great views. 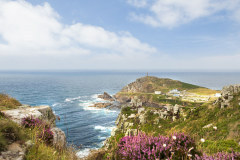 Brilliant for getting into St Ives and the Coastal park. Thanks Cornish Gems.